While it's easy to dismiss the sink as an installation that's only has practical implications, this is not always the case. 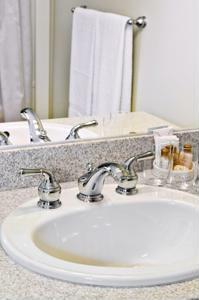 Many bathroom decor designers have thought of new and interesting ideas for creative ways to redesign bathroom faucets. For instance, take some of the lists appearing on Kolher Sinks Reviews and Oddee, which are loaded with options a person interested in installing a zany sink could look to for inspiration. Or, even if you have no interest in replacing your sink, they're good for a little quick entertainment. We've put together a list of our favorites from the two lists. Oddee provides some info on this sink, which is designed to look like it's overflowing all over the room. Considering that it's made by CBD Glass Studios, it might not be the wisest purchase if you've got little kids running around to worry about. Not to mention, it certainly demands some care. After all, if you had a sink this awesome, you'd certainly want to put some time into cleaning it. This one looks unabashedly cool. Oddee points to this sink, which almost resembles a large, slightly crumpled piece of paper, on its list of most interesting bathroom sinks. The source explains that it comes from the Brascor Countertops of Brazil Company, and is made out of a solid substance known as Corian, which is made exclusive by DuPont. Kohler Sink Reviews looks at this Roller Coaster Sink as a potential problem for moms, as kids might see it as a possibility to race toys (or this may not be a problem!). However, it has practical applications as well. The water doesn't drain in the basin, but goes down a spiral path into a drain in the floor. This could make it less likely that the sink will ever clog. So there could be more to this "Roller Coaster" sink than just a wacky design. The source points to this somewhat odd pairing, in which the sink is attached directly to the top of the toilet, as a more well-thought-out idea than the Roller Coaster sink. The sink review website stated that, this design makes it impossible to forget to wash your hands after you use the bathroom. While there may be some truth to that idea, you'd also have to be worried about hitting your head on the faucet if you sat down in too much of a hurry.